Reigi, proper etiquette, pronounced “reye-gee” is steeped within the Japanese culture, and especially in Traditional Martial Arts Schools. It is based upon respect of one’s Sensei, seniors, school, and equipment etc. However, in practise it is not as simple as this. Every action has a prescribed method, and failure to adhere to this behaviour may be taken as poor behaviour and respect. In some cases resulting in a severe insult. To the western mind these codes of conduct are hard to grasp and are much less rigid in practise. Nevertheless, as practising martial artists we should endeavour to follow Reigi to the best we can, and strive for its improvement. Because at the end of the day good etiquette is what separates us from some of our poor respecting peers. It is how we should interact with other human beings and therefore treat them with respect and courtesy as we ourselves would like to be treated. 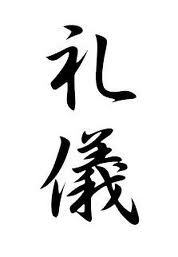 Reigi is then the cornerstone of how we conduct ourselves in our martial arts and everyday life. Without this Reigi our martial arts becomes another exercise activity, providing the physical benefits, but lacking the character and depth that it can offer. Etiquette develops discipline, through which comes structure and through structure we become familiar with the concepts that are being taught. However, this will then spill into everyday life to make us a better person. This is one reason why parents enrol their children in martial arts classes. However, it can be overlooked in some schools and also in everyday life. It was Gichin Funakoshi (Shotokan founder) that said Karate begins with a bow and ends with a bow. So this article is to try and explain Reigi in Traditional Martial Arts. Reigi should always come from the heart, with meaning, and not just paying “lip-service” to it; otherwise what is the point if you don’t really mean it. Take a step in through the door, and then turn towards Shomen. Present yourself in a dignified manner by going into Kiotsukete (attention stance) and bow (Rei) from the waist to about 60º. Don’t just nod the head. This again is done, from the same spot, upon leaving the Dojo. When Sensei gives you a technique respond by saying “Hai Sensei” (yes Sensei), or “Iie Sensei” (no Sensei). When Sensei has asked if you have understood, then respond the same way as above. When Sensei helps you, or has answered a question for you, then respond by saying “Arigatou gozaimasu Sensei” (Thank you Sensei). Be aware of high seniors (high ranking) members and follow their lead; after all they should have the correct attitude in etiquette and training. Do not sit down, or finish, bowing before your seniors. When lining up position yourself relative to your seniors. Be aware of juniors (low ranking) members and take care of them. Make them feel a part of the group, don’t look down on them, and help them whenever there is a chance. Avoid walking in front of Sensei, especially when they are teaching. Make sure your Gi (suit) is clean and in good repair. 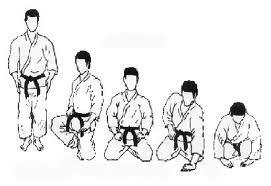 Respect your Gi and Obi (belt); fold them neatly at the end of class. Make sure you are correctly dressed to start your lesson. Tie your Obi correctly and that your Gi doesn’t have any dangling straps. Respect your sparring equipment; make sure they are clean and in good repair. Do not use them if they are going to cause an injury. Pay respect to your martial arts weapons. Bow to them before picking them up and putting them down. Never step over them, walk around if necessary. Make sure they are in good repair for training, i.e. well maintained, free from splinters and defects. Perform Ritsu Rei (standing bow) and Za Rei (seated bow) properly. Do not nod your head, but bend from the waist, as mentioned above. Hold your bow briefly before returning up-right. Say your acknowledgment when your are holding your bow, not on the way down or on the way up. When practising with your partner, or in line, at the beginning of the routine bow and hold, as described above, and say “Onegaishimasu” (please help me). At the end of a routine, again bow and hold and say “Arigatou gozaimasu” (thank you). Always say this with feeling, never quietly or mumbled. Again don’t say it on the way down or on the way up from the bow. Practise diligently. Do not sit down during practise, unless requested by Sensei. Do not engage in idle conversation during practise. Do not wear jewellery during practise. Place all items of clothing neatly out of the way before training commences. During Mokuso (meditation or quiet time) sit correctly and quietly, never slouch, and try to empty your mind of all thoughts. Everyone in the Dojo, spectators and students alike must be silent during this time. When a student arrives late for class they must stand and wait at the side. When they are called to join in then must be seen to carry out the required etiquette before commencing with their warm-ups. However, students should try not to be late. If they are then Sensei may stop them from joining the class, and make them watch. 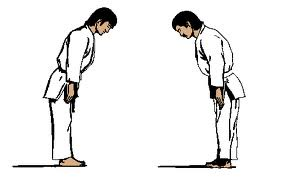 When approaching Sensei to ask a question the student should always bow first saying “Onegaishimasu” (please help me). It is the responsibility of the sempai (high ranked members) to see that Reigi is understood and followed by kohai (low ranked members) by setting the correct example. It is the responsibility of each member of the dojo to ensure that the various needs of the dojo are met. For example, setting up tatami (mats), getting equipment out and putting them back, make sure the dojo is clean and left clean when they leave. The cleaning may include the ritual of Soji (cleaning the dojo). Fulfilling these needs should be automatic and not prompted by the Sensei. They should be carried out gladly and without complaint. Taking care of the dojo, and oneself, should generate a feeling of pride in their dojo, and in doing things to the best of their ability. Don’t have dirty finger and toe nails, and keep them short.